I’ve always been hesitant to try the 10×10 challenge because I wasn’t sure how it would work for office wear. 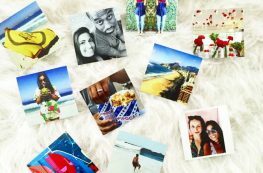 The challenge hosted by a Caroline calls for 10 pieces that you mix and match for 10 days. 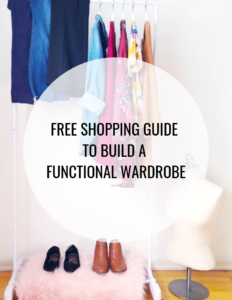 I’m no stranger to closet challenges and buying wardrobe staples (check out my 12 Months of Thrifting challenge) but this challenge made me wonder if I could mix and match casual and office wear over a 10 day period. 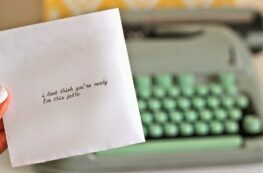 I decided I’m ready for a new challenge and the lessons this could bring. Caroline recommends checking the weather, your schedule, and developing a color palette for easy mixing and matching. As I was picking out my 10 fall essentials, I unintentionally selected burgundy, mustard yellow, camel, and navy as my main colors. 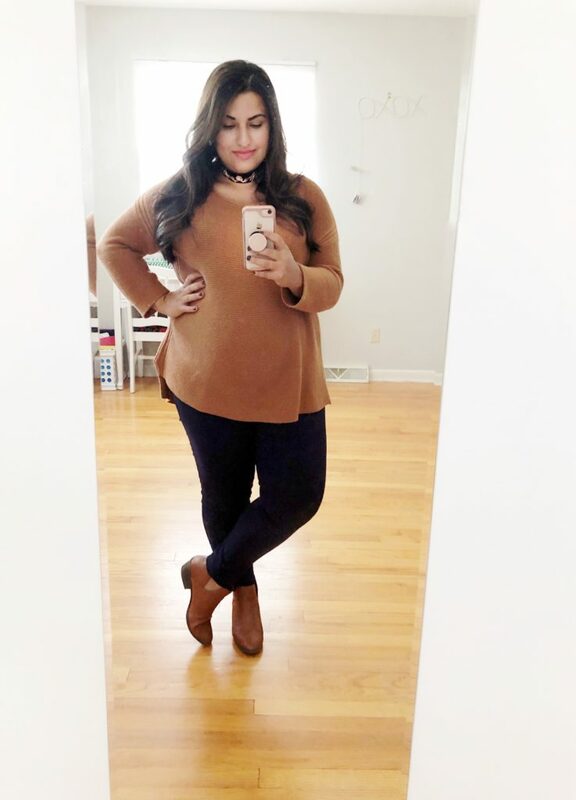 Looking back at some of my fall outfits, this seems to be my go-to color scheme when the temperature starts to drop. 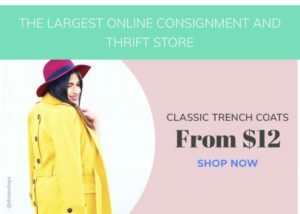 I selected 4 shirts, 3 pants, and 1 dress. 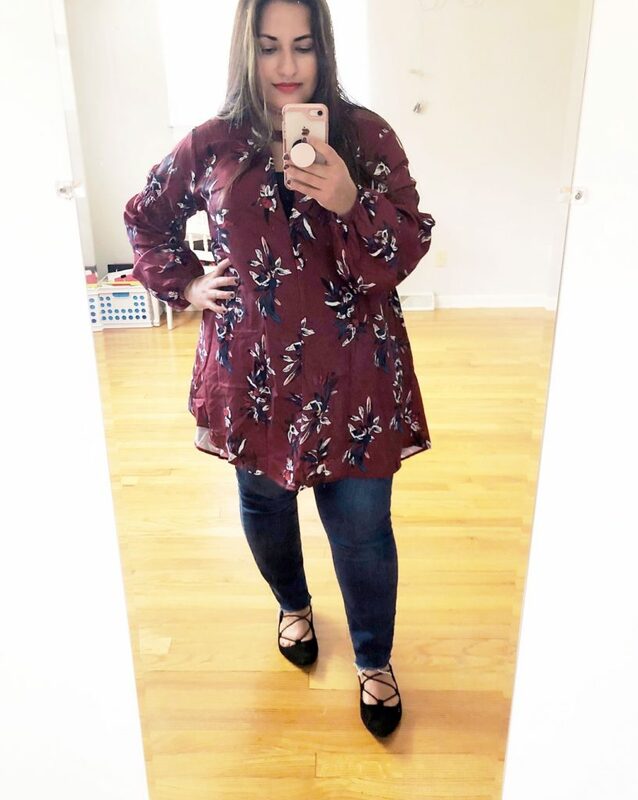 Unless I have a meeting, my office dress code is business casual so I can get away with trendier pieces, which helped me in selecting the tops. It was hard for me not to include a lot of prints so I forced myself to include one printed top and one printed dress. 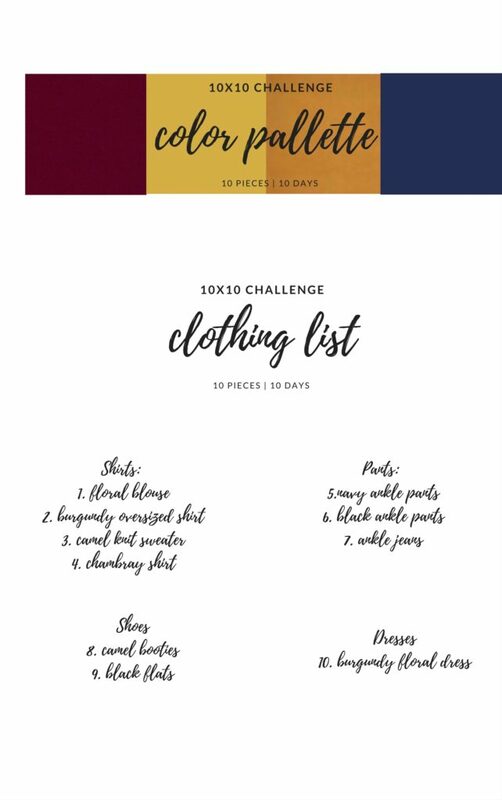 The great thing about this challenge is that the 10 pieces do not have include workout clothes or accessories. The accessories exception is a lifesaver! First two outfits were really easy because casual outfits are always a breeze. 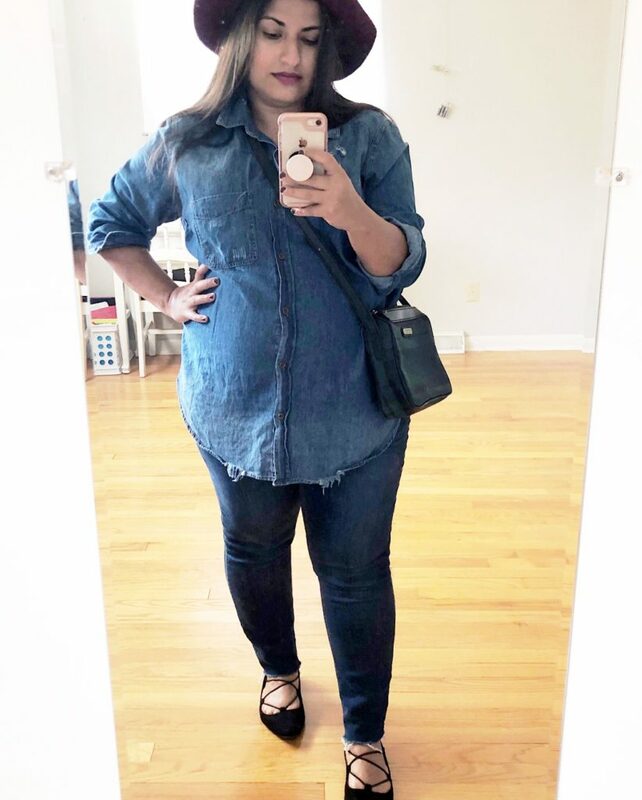 I wore my destroyed chambray shirt, jeans, and camel booties for a day at the farm. I didn’t do anything that day other than grocery shop. 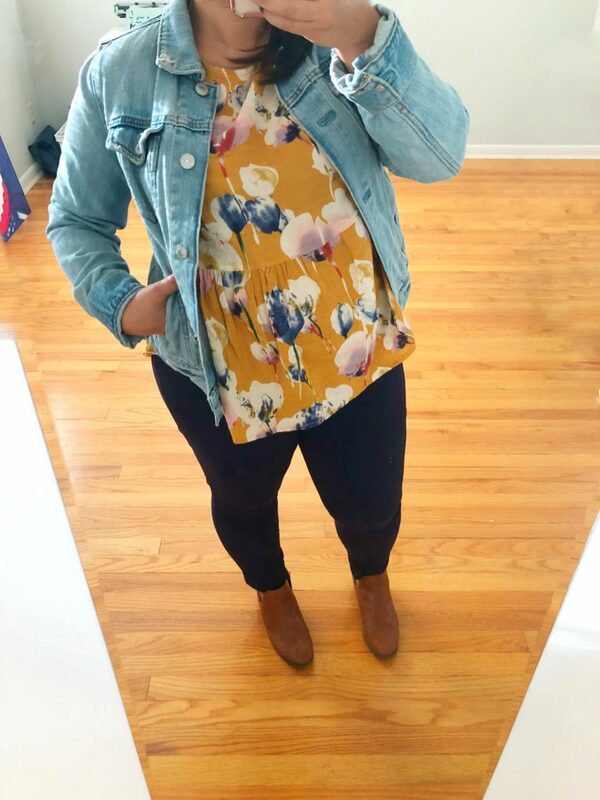 I was going to wear workout clothes to the store (note, I didn’t workout that day) but this challenge inspired me to actually get dressed. 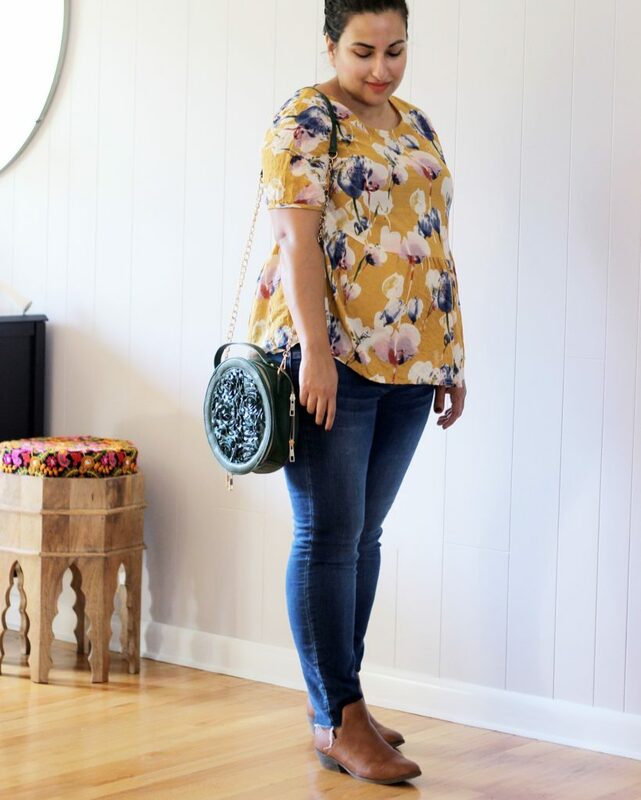 Same jeans, same shoes, different top. The week started off easy with one of my favorite dresses. 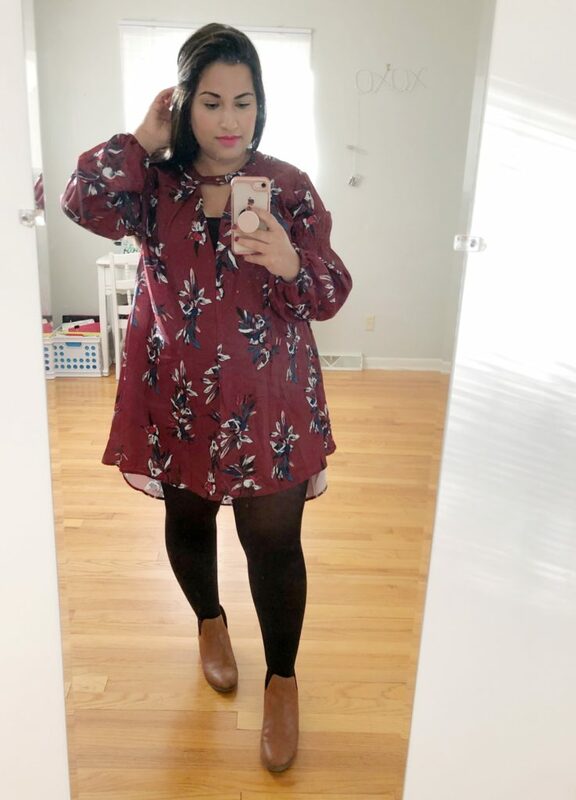 Same boots I wore all weekend, added tights and I was out the door! Still wearing the camel boots, this time with a camel knit sweater and navy ankle pants for work. Haven’t had to repeat any pieces yet. Thank goodness for accessories because this outfit definitely needed something, so I added a choker. 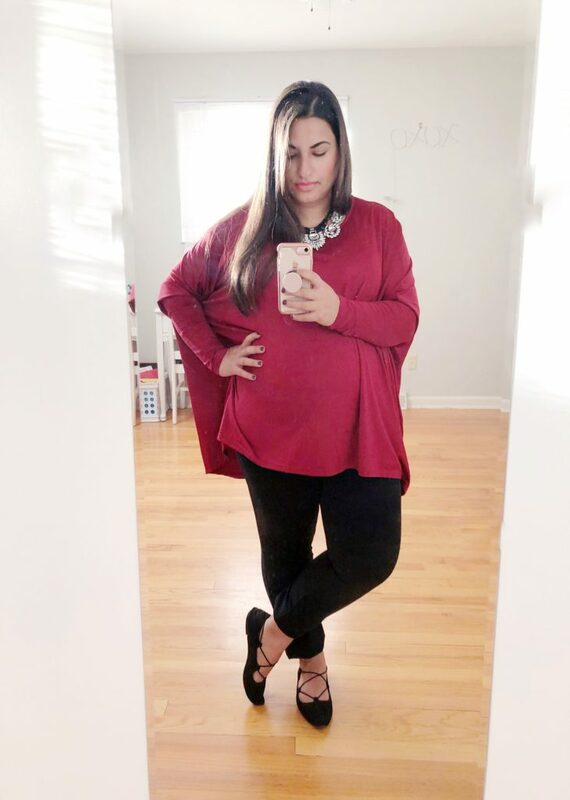 Burgundy oversized top with black ankle pants and black flats for work. Had to add a big statement necklace to spice things up. Starting to feel a little bored with these two pants, wish I would have added another dress to the mix. Had to start repeating and remixing pieces today. Definitely bored with these pants. Wearing the navy ones again today. They all look black in these photos, but I’ve been rotating the black and navy. I had to “cheat” a bit today by wearing my thrifted denim jacket because it was so chilly in the morning. I am glad to see that this shirt can be worn to the office or on the weekend. That’s a plus. 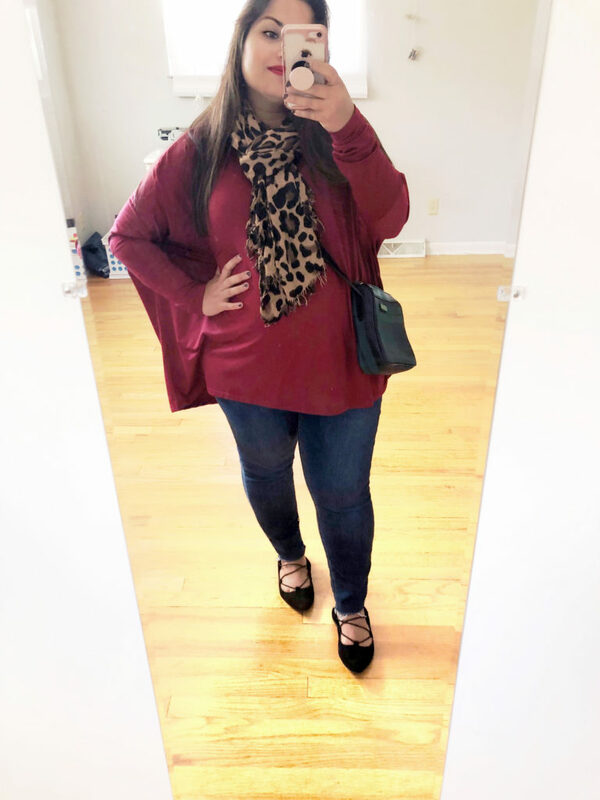 I planned to wear this outfit to work for casual Friday but this day marked the beginning of an awful cold so I wore this to the doctor’s office. Having the 10 pieces handy sure made it easy to get ready on a day I wasn’t feeling well. I wore this outfit twice. I was excited about this remix because I never thought to wear this dress with jeans. I wore this to an event I hosted at Goodwill. Accessories were definitely a lifesaver during this challenge. Wearing the same shirt I wore earlier in the week to work, this time with jeans and my $1 leopard print scarf. Overall, it was a fun challenge. I really liked how quickly I was able to get dressed in the morning. I did start to feel a little bored with my selections and wish I would have added another dress for work. I’m not sure that this challenge is entirely realistic for people who have to dress professionally in an office setting all the time. I was able to get away with it because I didn’t have a lot of meetings scheduled and my office dress code is generally business casual. I think maybe 20 pieces would make it more realistic to mix casual and business clothes. Would I do it again? Yes, possibly. I like the challenge of using accessories to spice things up and wearing some pieces multiple ways. 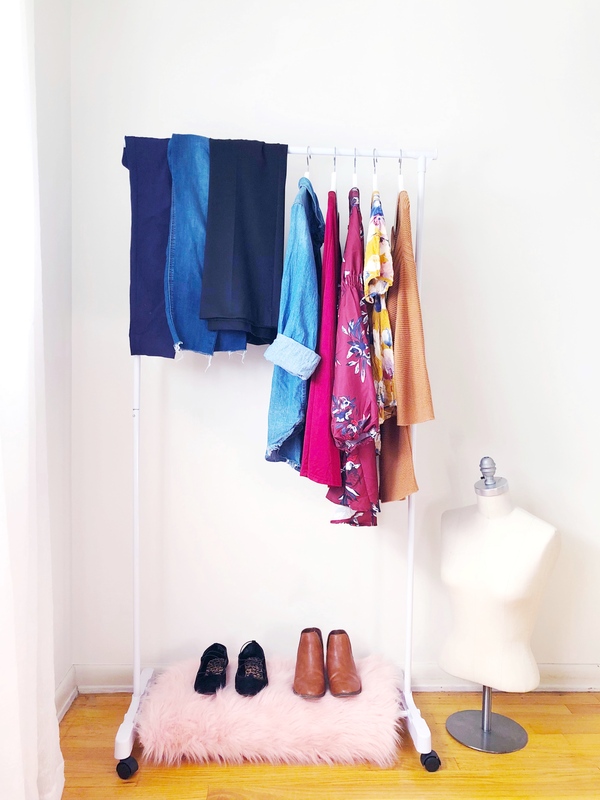 I recommend putting your clothes on a separate garment rack if you have one, I liked being able to bee line to my rack and not feel distracted by other things in my closet. It was so weird opening my closet for the first time in 10 days! I missed my other clothes! 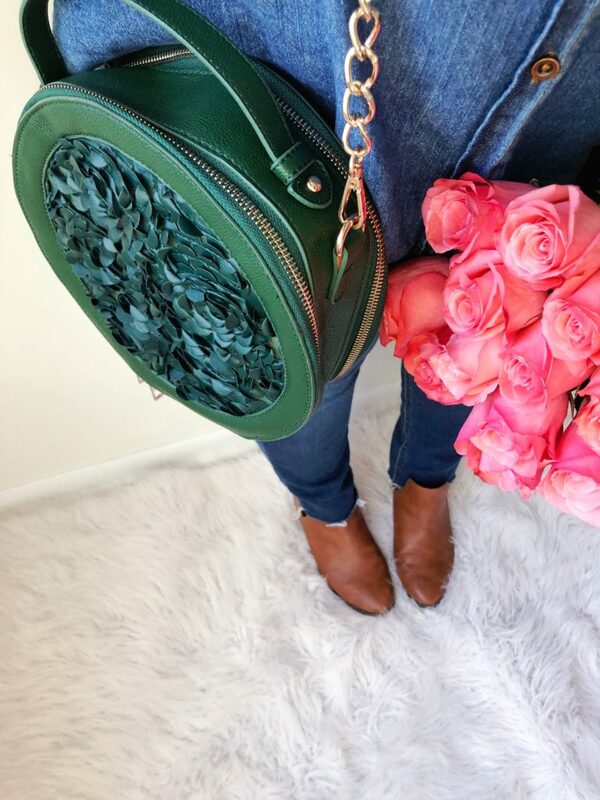 Here’s a link to all of the items I selected for the challenge and a link to a bag similar to my round green purse that I scored for $5!